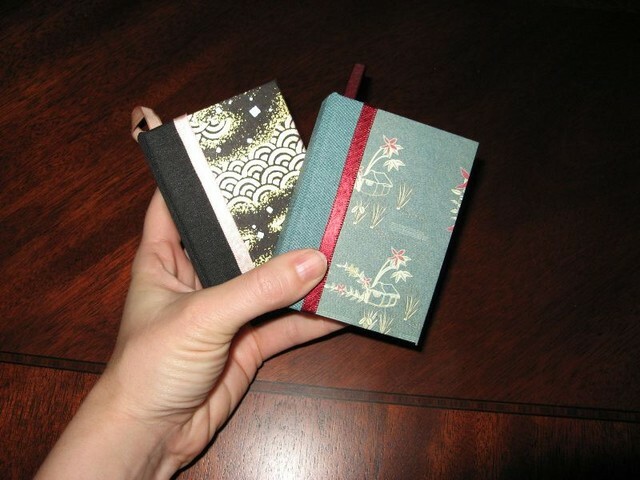 I attended a Bookbinding class at Vroman’s, a local bookstore. In this four-hour course, we learned how to construct a simple binding and created two small examples (see right). 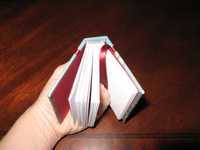 The instructor provided us with paper “folios” (folded sheets in sets of six) and all of the other materials. We did the rest. I took detailed notes on the process, but without step-by-step pictures it would be a very long entry indeed to convey all of the instructions. Instead, I’ll focus on the interesting tidbits I took away with me. The type of book we made is called a “codex”, which consists of multiple “signatures” (folios sewn through their folds into little six-sheet booklets). In our case, the signatures are sewn individually; I think traditionally they would all be connected with a single length of thread, which would increase the book’s cohesive strength. Our individually sewn signatures are connected by merit of some strong liquid glue and fabric-paper along the spine. In theory, a signature could fall (or be pulled) out due to this construction. Making the book casing was one of the most enjoyable parts of the process, since you get to pick a pretty colored paper to wrap around the boards for the cover. You fold the paper around the cardstock, mitring the corners, and then glue “end papers” (cardstock) on the inside edges to give it a finished look. The little colored strip at the top and bottom of the book’s binding (click image at right to enlarge) is just a bit of decorative tape, at least for the books we made. It doesn’t actually do anything for the binding. We finished by “embellishing” the books with ribbon trimming and (in my case) a ribbon bookmark that’s glued into the cover. Nothing like a built-in bookmark!